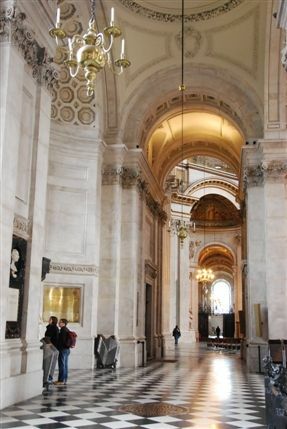 Being the cathedral of the capital city, St Paul's is officially the spiritual home of Great Britain. The funerals of Lord Nelson, the Duke of Wellington and Sir Winston Churchill were conducted inside the church's fortress-like walls, as was the elaborate fairy-tale wedding of Prince Charles and Lady Diana Spencer. Built by court architect, Sir Christopher Wren, after the Great Fire of London in 1666, the cathedral miraculously survived the Blitz in World War Two when most of the surrounding area was flattened by German bombing raids. It consequently served to act as an inspirational symbol of British strength in the nation's darkest hour. During the construction of the dome and galleries, architect Wren was wrenched up and down in a basket at least once a week to inspect the work in progress. By the time work was completed in 1708, Wren was 78 years old and watched on as his son placed the last stone in position. Three curving galleries lead up to the dome - one of the largest in the world and one of the best viewing points in the City. Best for Architectural symbolism and sentiment, medieval relics and Victorian mosaics, curving galleries and great dome.